As pilot in command, you take the responsibility for the safe operation of your aircraft seriously. You have your passengers' trust that you will get them safely from point A to point B. The general aviation single-piloted IFR cockpit can be one of the busiest places on the planet when the weather is rough and you're on the gauges. Good operating practices'such as thorough pre-flight planning, maintaining your IFR currency, and designing realistic personal minimums'all contribute to safety of flight. Additionally, understanding and knowing what services and information the ATC system has to offer can sometimes make the difference between a miserable flight experience and a pleasurable one. This time of year, our attention turns to thunderstorms. From May 2003 through May 2006, there were 11 accidents involving general aviation aircraft whose pilots inadvertently flew into severe convective weather conditions. Ten of the encounters were fatal and the eleventh suffered substantial damage to the aircraft. In the spring of 2006, the Federal Aviation Administration's (FAA) air traffic organization revised the terminology and phraseology its air traffic controllers use to describe areas of weather radar echoes in the National Airspace System (NAS). The four terms''light,' 'moderate,' 'heavy,' and 'extreme' - each represent precipitation intensity level paired with a dBZ range (Figure1) to help pilots interpret the severity of the flight conditions present. ATC's precipitation information can also complement the information that you may already have from your own on board weather displays or radar. While the ATC view can sometimes provide a bigger picture of what is out there, keep in mind that the air traffic controller's first duty priority is to separate aircraft and issue safety alerts regarding terrain, obstructions, and other aircraft. Additional services, such as suggested headings or radar vectors to assist pilots to avoid areas of precipitation, will be provided to the extent possible, but the service is contingent upon higher priority duties and other factors including limitations of radar, volume of traffic, frequency congestion, and workload. Subject to these factors/limitations, controllers will issue pertinent information on precipitation areas that are displayed to them on their radarscopes. The precipitation areas that the controllers see on their radarscopes can be as old as six minutes before the weather data is updated. This is important to remember because convective weather is transient and can change rapidly. Thunderstorms can develop at rates exceeding 6,000 feet per minute, which is faster than the updates. To rely solely on ATC as a source for weather avoidance is not entirely prudent. It is the pilot's responsibility to obtain a preflight weather briefing. Any ATC reported weather information, along with periodic contacts with Flight Watch while airborne, would supplement what was learned during the preflight briefing, The ATC reports of precipitation areas are of value because they can give you a global view of what is in the area. Pilots who have on board weather radar or lightning detection systems can benefit from the big picture that ATC can paint and can use the aircraft's on board systems to pick the best tactical route to avoid severe weather. ATC can tell you what is in your immediate path, but won't tell you what to do. It's up to you. ATC can tell you whether or not an area of precipitation awaits you and some can tell you if it is Light, Moderate, Heavy, or Extreme. It is up to you to decide what to do. Be prepared to tell ATC what you want to do. ATC can provide approval for you to deviate from your assigned course so that you can skirt around the weather yourself. Do you want assistance? ATC can provide you with a suggested heading to take you to one side or other of the weather, but remember, ATC radars cannot detect the presence or absence of clouds or turbulence, so the headings convey no guarantee that you will not encounter hazards associated with convective activity. If you wish to circumvent the area at a specific distance, you must make your desires clearly known to ATC at the time of the request for the service. Rainfall rates are difficult to associate with the intensity levels because they can vary significantly depending upon whether they occur in convective or non-convective conditions. Since 'Mother Nature' can be capricious, suffice it to say that in convective conditions, once you get near the Moderate range of precipitation, you should expect difficult conditions. All thunderstorms and convective activity should be expected to have turbulence associated with them. Operation in and around such conditions should be approached with great caution because the severity of turbulence can be markedly greater than the precipitation description might indicate. Turbulence should be expected to occur near such areas, even in clear air. A good rule of thumb is to give thunderstorms a wide berth. (d) any further deviation(s) that become necessary. 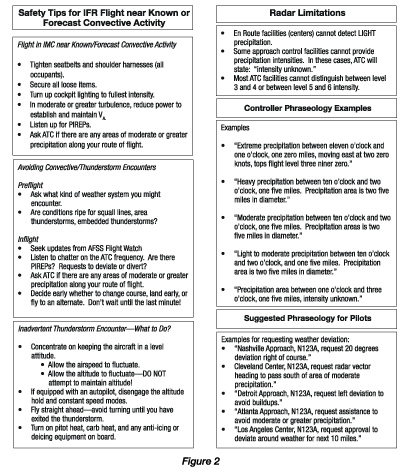 Thunderstorms and ATC is an excellent on-line program from the AOPA Air Safety Foundation containing more information for pilots is available at <http://www.asf.org/wxwise_thunder>. 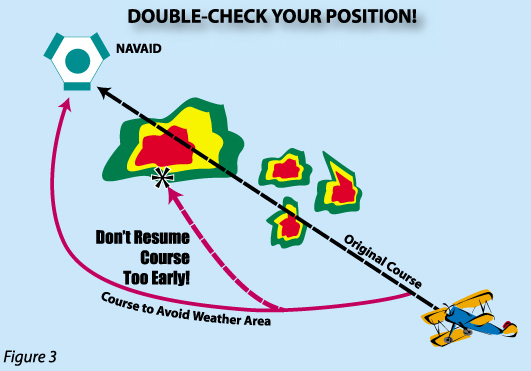 If you are flying an off course heading that is taking you around or away from bad weather and ATC issues you a clearance to resume on course or proceed direct to the next NAVAID when able, maintain your situational awareness. In other words, don't undo what you were trying to do! Ask ATC whether or not you are clear of the weather area if you don't already know. (See figure 3) If you turn to the direct heading too soon, you could very well put yourself on a direct course to enter the same weather that you were trying to avoid! ATC may be very busy, but double check with them. The controller can see where your aircraft is in relation to the precipitation area and where your heading will take you. ATC may be busy, but remember, your well being is on the line, and no controller wants you to put yourself in jeopardy! If you are on an assigned heading or deviating on your own to avoid weather areas (with ATC's approval) and are switched to another controller's frequency, make sure that the next controller understands that you are deviating or are on an assigned heading to avoid a precipitation area. If you want continuing heading/vector services, make sure the controller understands what you want. Do not assume that the controller knows this! Reading minds is not one of the skills for which controllers are selected. Use the In-flight and Flight Watch Service for weather updates. Flight Watch can tell you what the big picture is so that you can decide whether or not it's time to call it a day or continue the flight. PIPE UP WITH A PIREP! PIREPs are one of the most valuable sources of information for pilots. Volunteer PIREPs for your flight conditions such as visibility, turbulence, icing, lightning, precipitation intensity, cloud tops/bases/layers. These reports can ease your or other pilots'travels through the system. So be a good sport and give a report! ATC's first duty priority is to separate aircraft and issue safety alerts. ATC will provide additional services to the extent possible, contingent only upon higher priority duties and other factors that include limitations of radar, and workload associated with volume of traffic and frequency congestion. Generally, when weather disrupts the flow of air traffic, greater separation demands are placed on the controllers. Try not to wait until the very last moment before asking for deviations from course, or for assistance to get around or away from areas of severe weather. When severe weather is in the area, controllers will be very busy and may not be able to respond to your requests promptly. When encountering weather conditions that threaten the safety of the aircraft and its occupants, the pilot may exercise emergency authority as stated in 14 CFR 91.3 should an immediate deviation from the assigned clearance be necessary, and time does not permit approval by ATC. It is better to think ahead and be prepared so that you do not have to resort to emergency action. Christine Soucy is with FAA's Office of Accident Investigation, Accident Coordination Branch.